In his brilliant and page-turning new book, W. Scott Poole uncovers the importance of H.P. Lovecraft. 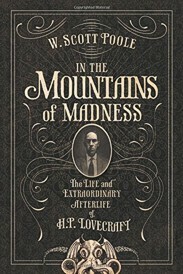 No one has written about Lovecraft quite like this—a survey of his life but more importantly an examination of his influence that stretches out to role-playing games, film, television, books, comics, and much more. W. SCOTT POOLE teaches at the College of Charleston and has written widely about American history, horror, and pop culture. His books include Vampira: Dark Goddess of Horror and his award-winning history Monsters in America. Poole has written for Popmatters and his work regularly appears in the Huffington Post. In the Mountains of Madness: The Life and Extraordinary Afterlife of H.P. Lovecraft. By W. Scott Poole. Berkeley, CA: Soft Skull Press; 2016; ISBN 978-1-59376-647-4; paperback; 304 pages. This book may be purchased in paperback from Amazon.com or Barnes & Noble or directly from the publisher, Soft Skull Press.